Home	Stocklist	Other Brands	Blancpain. Gents Watches, Other Brands, Blancpain. 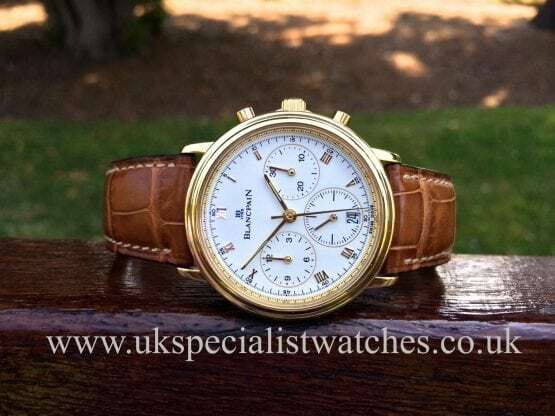 Gents 18k Gold Blancpain Villeret Split Second Chronograph Classic white dial with applied 18 ct Roman numerals. The date and small seconds are positioned at 6 0'clock, the hour recorder at 9 and the minutes are at 3. Solid 18ct gold case with fixed stepped shaped bezel houses the automatic movement, sapphire crystal antireflective glass. New tan brown genuine Blancpain leather strap with the original Blancpain 18k gold pin buckle.The watch in immaculate condition and comes complete with original box papers instruction booklets and service history,UK supplied. 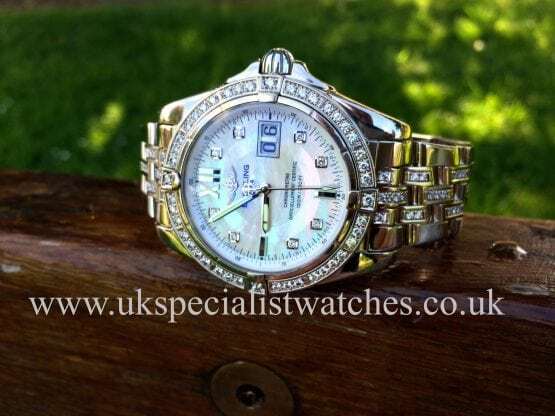 Recently Sold, Other Brands, Blancpain. 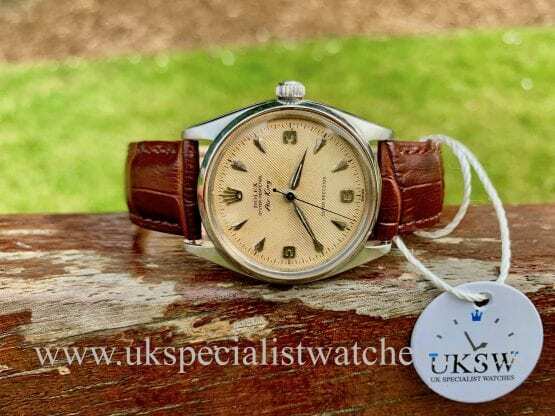 Blancpain have never manufactured a quartz movement!! 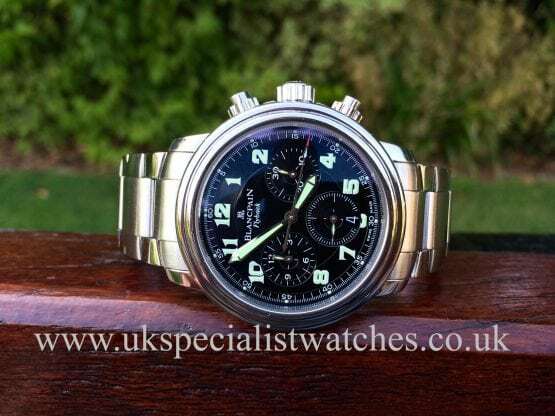 !, this in itself is a large statement for any watch manufacturer.Our Blancpain Flyback Chrono. has the Léman sports dial with luminous numerals and sword shaped hands.and the red tipped second hand. 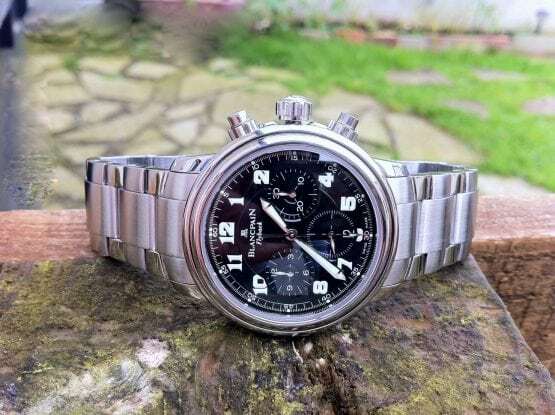 Houses Blancpain's automatic F185 movement, this flyback was originally used by pilots, allowing them to reset the chrono seconds hand to zero and begin timing again without stopping the chronograph. 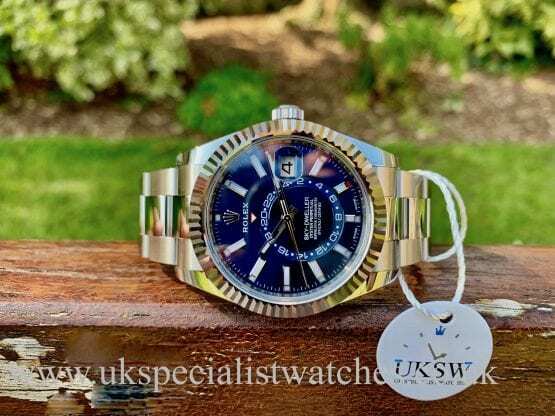 With the well secured screw down crown and chrono pushers its water resistance to 100m, our watch is in as new condition.